Managing a Successful Compliance Emission Measurement Program - Environmental Quality Management, Inc. Emission measurement is a crucial component for any business that must remain compliant with local, state, and federal environmental regulations. While the measurement process can be straightforward and seamless, it can also be lengthy, complex, and result in lost production time. However, there are some simple ways you can make the testing process easier. Things like knowing what will trigger a compliance test, understanding the test protocol, and making appropriate site preparations all play a vital role in ensuring you maximize the testing crew’s time on site while minimizing the impact to your production. Knowing in advance what triggers a compliance test gives you time to prepare you facilities for emission testing. For example, some compliance triggers happen regularly and give you plenty of advance time to make the necessary allowance in your production schedule. Title V Permits, Federal Maximum Achievable Control Technology (MACT), and National Emission Standards for Hazardous Air Pollutants (NESHAPs) all require testing either once per term or annually. However, it is critical that you understand your permit requirements and what federal regulations your business falls under. If you are unsure about testing frequency, then there is a good chance you’ll be caught off guard. Other compliance triggers occur when your facilities undergo new construction, you modify your process or equipment, or there’s a change in existing regulations that pulls in new emission sources. While these can be a little more difficult to plan for, some foresight and advanced planning can save you lots of time. One of the simplest ways to keep track of all your compliance triggers is to make a compliance calendar like the one below. Armed with a simple calendar, you can make all the upfront preparations necessary to ensure a smooth testing process. What’s more, knowing well in advance when your compliance triggers will hit allows you to make the necessary budgeting decisions. It also gives you plenty of lead time to understand the exact scope of the testing requirements, make the appropriate safety preparations, and draft a request for proposal. It’s best to start planning for an emissions test at least 6 months in advance, but even a month of preparation will go a long way. Before testing can begin, most state and federal regulations require an intent to test notification (ITT). While these may appear to be simple forms, some state specific ITTs can be lengthy and complex. What’s more, it’s crucial that all the information in your ITT is filled out correctly. An incorrect ITT can cause multiple problems like testing delays or incorrect testing. While you can complete these forms yourself, it is better and safer to include this in your scope of work when soliciting 3rd party testing companies. Emission testing firms should be intimately familiar with these forms and know all the ins and outs of completing them correctly. While choosing a 3rd party to fill out your ITT forms is a good idea, it doesn’t mean you shouldn’t review the forms before they go out. Even the most experienced emission testing agencies make mistakes. Items like permit and regulatory requirements, scope of testing, and proposed production information should all be reviewed for accuracy regardless of who fills out your ITT forms. Once you have reviewed the ITT for accuracy, the only step left is to send it to the appropriate government agency. Most agencies require you to submit at least 30 days in advance but there are some federal forms that require submission more than 60 days in advance. However, there isn’t a good reason to put off submitting your ITT. So, if it’s complete and accurate, it’s in your best interest to send it in as soon as possible. Pre-test meetings are an optional part of emissions testing, but they are highly recommended. Conducting a meeting at least 2 weeks out from the test date ensures that everyone is on the same page. It gives the test team the opportunity to meet with EHS, production, operations, maintenance, and regulatory personnel to clear up any remaining questions or concerns they might have. It also gives you the opportunity to review the test dates and expected production operating scenarios and go over who will be working on the test day. Holding a meeting before a compliance test also lets you conduct any required safety training with the testing crew. Another import part of a pre-test meeting is to determine how your process data will be collected. Process data is critical for ongoing parametric monitoring and is as important as emission data. Things like production rate, RTO temperature, scrubber water flow and pH, fan amps, and damper positions all need to be recorded. A meeting before testing begins is a perfect opportunity to confirm who will be collecting this data and how it will be collected (e.g. pencil and paper, data logger, etc.). A pre-test meeting also allows you to conduct a sampling site review with the test team. This can be a critical step for guaranteeing that things proceed smoothly and according to plan come testing day. One of the most crucial aspects of stack testing is confirming that the test ports meet EPA Method 1 criteria. The last thing you want is for the testing crew to arrive only to discover you have no acceptable ports to test from. The image below shows some of the criteria that a sampling port must meet. Reviewing the sampling site with the emissions testing team also give you a chance to address any access needs. 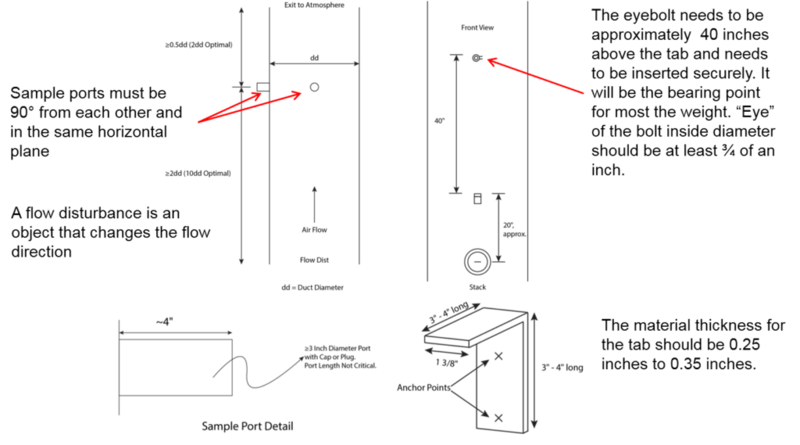 For example, the crew might require scaffolding or man lifts to reach the sampling port. You can also resolve any issues regarding the crew’s lighting or power needs. Assuming you’ve done all your prep work, test day should be a breeze. With everything in place, the testing team should be ready to start work once they arrive on site. As with anything, however, there’s always the chance for unforeseeable complications and setbacks. 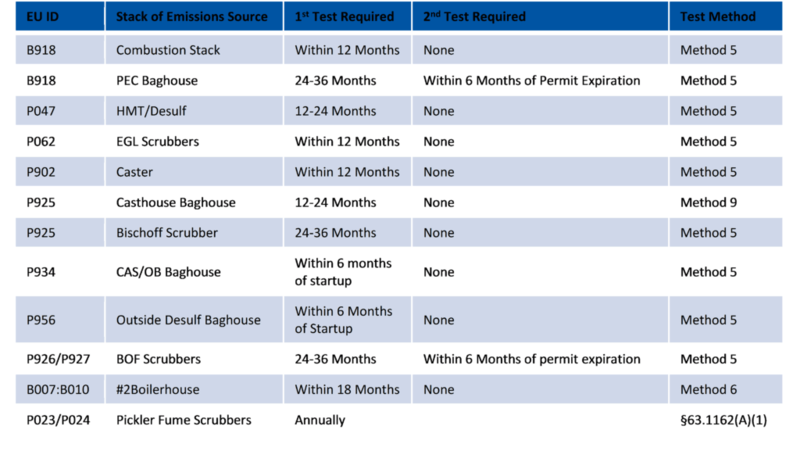 But, laying the ground work for your emissions testing goes a long way to minimizing these complications and ensuring that testing has as little impact on your production as possible. 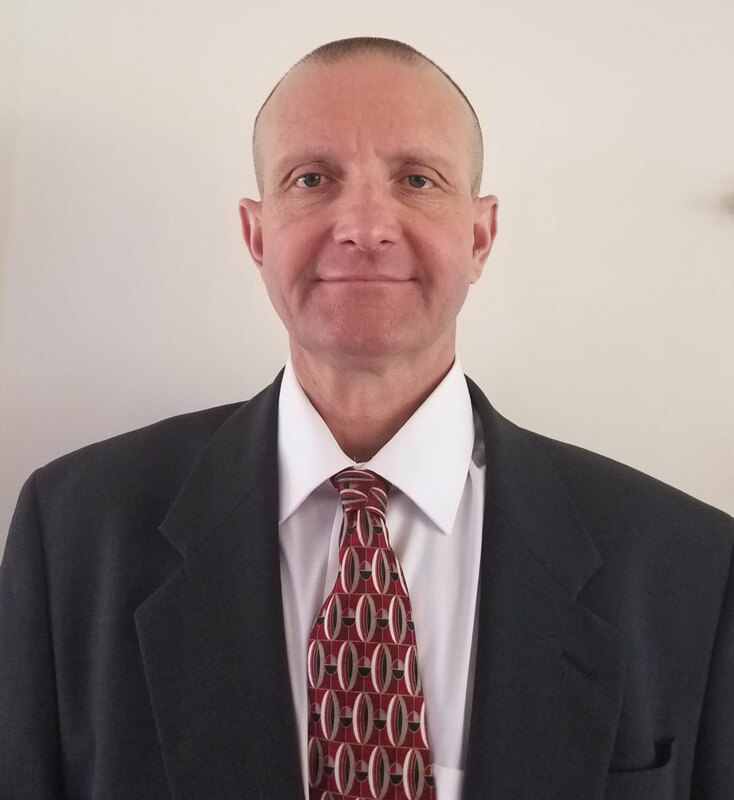 Tom Gerstle is the Vice President of Engineering and Consulting Programs and Emission Measurement at Environmental Quality Management, Inc. (EQM). Mr. Gerstle has more than 30 years of experience in air compliance, emission measurement and evaluation, emission factor development, source apportionment, and regulatory compliance. Mr. Gerstle graduated from the University of Cincinnati with a B.S. in Civil and Environmental Engineering and a M.S. in Environmental Engineering. He is a Professional Engineer in the State of Ohio and a Qualified Source Test Individual (QSTI Sections 1-5).